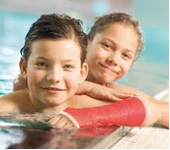 Swimming, bathing, showers despite a plaster !! The desire of the patient in the course of a treatment always to get the most optimal possibilities is more than understandable. Never fits in someone’s lifetime scedule the acute injury with it’s bruises, fractures and following treatments. And in a postoperative treatment care the „resting and healing progress“ is never giving time. Always you hear it again and again the „why me and now“.The most important medical indication for resting in combination with improved everyday suitability has now been successfully developed. The previous restorations with conventional plaster were mostly very difficult, extremly heavy, absolutely waterless, and thus the daily life as well as the holiday benefit of the patients but considerably restricted. The solution for an unrestricted use, even in everyday life, despite the use of gypsum dressing, offers a special cushioning material under a modern ultralight synthetic support band. The material is waterproof, breathable and washable, allowing the patient to shower, bathe or even swim, despite a so-called stable cast dressing. Even the necessary rehabilitation measures can now be carried out successfully thanks to this special technique. By means of this innovative three-dimensional construction made of water-resistant fibers developed in medical technology, a required stability with wear comfort could be achieved. The open fabric structure allows the water to drain from the casting belt, while the residual moisture evaporates with the aid of the body’s heat. Most dressings dry within approx. 90 min. An adhesive coating facilitates the installation and prevents slipping of the bandage during the dressing. The risk of skin macerations, pressure points as well as smell and skin jumps is reduced by the special under-cushioning. With sufficient experience in plastering and learning the new materials is for the experienced specialised orthopaedist absolutely no problem. In Bendinat/Calvia at Medisport-Mallorca Center the orthopedist / traumatologist and experienced sports physician Dr. Marco SEITA (0034-661939395) – made very good experiences in the past and uses this new technology as a matter of course in addition to other specialized associations such Kinesiotape / Sports Tape / and other special techniques regularly as part Its wide conservative treatment concepts.